Access Modifiers in C# allow you to control access to the class and to restrict the ability of the class to be instantiated or to serve as the base of another class. The class modifiers are public, protected, internal, private, abstract, sealed, and new. Internal is the default if no access modifier is specified. 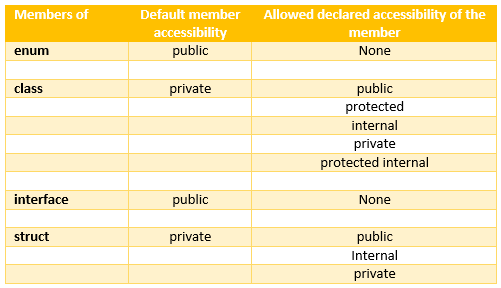 Class members (including nested classes and structs) can be declared with any of the five types of access. Struct members cannot be declared as protected because structs do not support inheritance. Interfaces declared directly with a namespace can be declared as public or internal and like classes and structs, interfaces default to internal access. Enumeration members are always public, and no access modifiers can be applied. By default, delegates have internal access. Next : What is a sealed class in C#?